As the amount of information we are asked to process on a daily basis continues to increase, information management will be among the enterprise and technology trends to be discussed in 2019. This blog lists the key information management trends for 2019. Technology has facilitated an insatiable appetite for data. In the consumer world, unlimited mobile data plans, data-streaming platforms like Netflix and Spotify, and internet connections with faster download speeds and wider network coverage make it easier than ever to consume data. In the enterprise world, business intelligence and data analytics platforms derive more value from data, while tighter regulations make the cost of non-compliance with data privacy steeper than ever before. These business needs dictate that information needs to be managed better than ever before. Information managers should keep on top of the latest information management trends as their jobs become more complex in the modern workplace. Information management trends for 2019 concern how information is generated, captured, classified, and discovered. Information managers that capitalize on these trends will be better positioned to do their job to a higher standard. Here are some of the key information management trends for 2019. Between 2012-2013, the world generated 90% of the data that had ever been created up to that point. We have repeated this phenomenon every subsequent year. In 2016 our combined data output reached 2.5 trillion gigabytes per day. The ‘Data Never Sleeps’ report claims by 2020 every person in the world will create 1.7MB of data per second. The good news is we’re not at risk of there being ‘too much data’, at least in terms of storage. But so much data has created information overload; its abundance overwhelms workers, shortens attention spans, and disrupts focus. In the rush to unify all the different sources of information within your business, a top information management trend for 2019 is the need to ‘rein in data’. An automated classification scheme can help end-users classify information without the legwork. For example, automated metadata practices remind users to add metadata tags when files are first stored in their document management system like SharePoint to help create a consistent taxonomy of information. It’s natural that applications have transformed alongside the rise of data. They are the vehicles for our rapid data consumption. There are more apps than ever, and it has become common practice for us to constantly toggle between them. This is particularly true on smartphones, where notifications act as the bait to hook you into an app and keep you in a near-constant state of multi-tasking and distraction. In the enterprise, distraction is much more of a problem than in the consumer world. The ‘False Promise of the App Economy’ revealed that workers are overwhelmed with the number of apps that they are expected to use to get work done. This leaves them frustrated by the confusion that occurs when they’re switching between app windows to complete tasks, find information, and communicate with colleagues. In 2019, app overload will continue to be a problem unless businesses react. Information managers should look to flip the script on the way they use apps—reserving their focus for the apps that are essential to the work they need to perform. In platforms like Office 365, which house a variety of business apps, identify the apps you actually use and combine them. Creating a single window for your work is the ultimate focus-enhancer. As the amount of information continues to grow from a variety of sources, more attention is being taken to its legitimacy. While ‘fake news’ shouldn’t make its way into the enterprise, stipulations like the GDPR pose strict regulations and severe fines for non-compliance. Information managers should take careful consideration of the different types of information and the different ways it must be governed. Emails are often overlooked as documents of record. But business-critical and sensitive information can be contained in attachments or within the body of an email itself. When it comes to employees searching for this information at a later date, the problem rears its ugly head. From a compliance perspective, information managers need to treat emails as documents of record, prioritizing email management the same way they prioritize information management, so sensitive information isn’t lost to lengthy email chains or in personal inboxes. Topic computing is a new approach to information management. Instead of asking users to navigate through content repositories to find the information they need, it categorizes information into topics to push to the user in context. For instance, when an employee receives an email about a certain subject, topic computing software uses artificial intelligence to bring them content related to that email from across all the different apps and tools they use. This means information is brought to them at the right time and in the right context—and that they don’t have to visit multiple locations to find it. Topic computing is set to flourish in 2019, and harmon.ie is at the forefront. harmon.ie is striving to change the way information is delivered in the digital workplace through intelligent information management and topic computing. Intelligent information and email management unifies otherwise disconnected information from multiple cloud apps—SharePoint, Microsoft Teams, Skype for Business, etc.—within the employee’s current work interface: Outlook. Through topic computing, harmon.ie is looking to revolutionize how information is presented to users to reduce distraction, empower workers, and drive productivity. Stay tuned for general availability of harmon.ie 10 which will debut topic computing technology, coming in 2019. 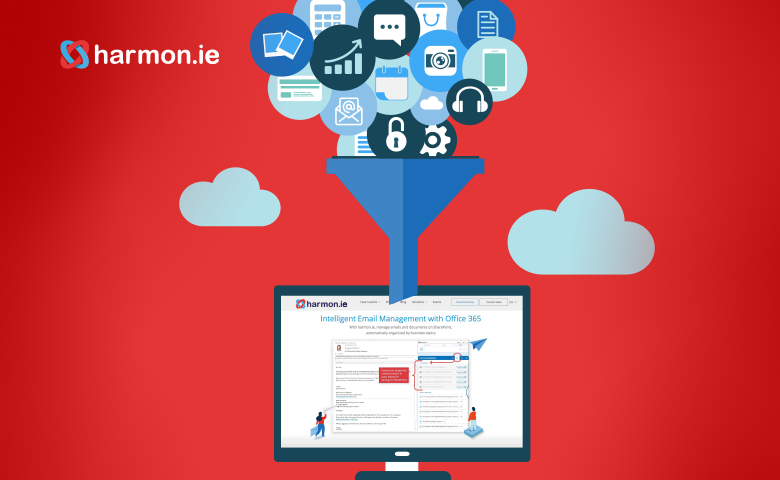 For more information on how to improve your information management practices, get in touch with the harmon.ie team today.